Co2 is used at critical pressures and temperatures for extracting vital ingredients from lead. No harmful chemicals or high temperature is used in the extraction method. Result obtained is an extract in concentrated form, closely resembling the herb. The SCFE extraction is superior for various reasons. In the conventional method, chemical solvents like acetone, propylene glycols and derivatives of petroleum are used besides alcohol and heat which causes damage to the beneficial phytochemicals. Natural extracts which are solvent and alcohol free are in highest demand. The SCFE Co2 method enables photochemical delivery in a broad spectrum including oil soluble and water soluble phytochemicals. The herbal extract obtained is 100 times stronger and purer than conventional extracts. As a solvent, only Co2 is used and the extract left is void of any solvent residues. When Co2 is compressed it has properties of gas but with liquid density, leading to quicker diffusion of phytochemicals. Pressure is released on completion of the extraction and CO2 is released harmlessly. Neem extract extracted by the SCFE CO2 method is extremely pure and 100 percent natural. 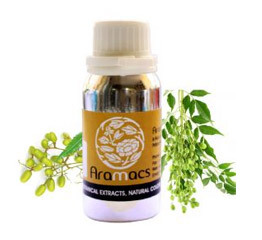 Natural ingredients of the plant or the healing phytochemicals are best captured after harvesting neem. Due to this, purity and superior potency of neem oil is retained. Neem has the botanical name, azadirachta indica. Seed kernel is used for extracting the oil. It is from tetracyclic triterpenoid tirucallol, a one parent compound that all neem compounds that are biologically active are derived from. Rest of the products formed, are termed as tirucallol oxidation and successive rearrangement products. Azadirachtin is the main tetratriterpiniod compound that has been accepted for many of the biological effects seen in organisms with neem exposure. Neem products are widely used as growth disruptors, antifeedants, bio pesticide and repellents. 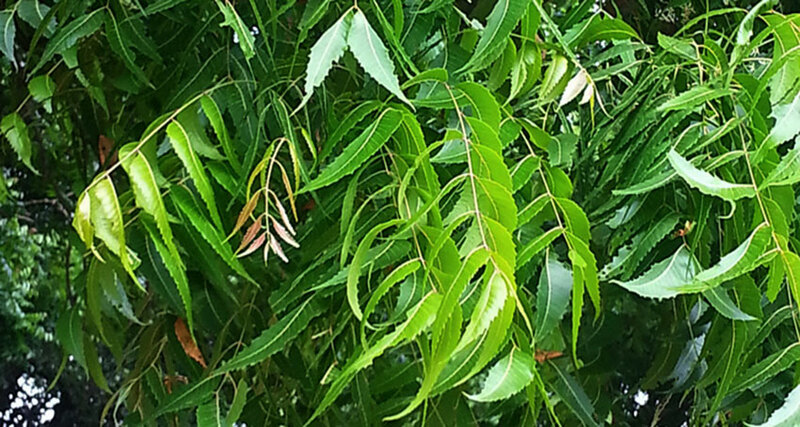 Neem extract has a number of therapeutic, toiletry and cosmetic uses. It is best used externally. In folklore medicine it is used in leprosy, constipation, respiratory disorder control and as an excellent general tonic. In treating ringworm, rheumatism, athlete’s foot, eczema, warts, psoriasis, infected burn wounds, syphilitic sores, cold sores, infection in skin and skin ulcers, it is used as topical treatment. 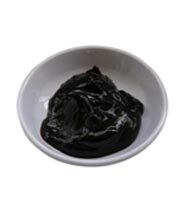 The oil has analgesic, antipyretic and anti-inflammatory properties. It increases defense mechanism of the body due to its immune-stimulant activity and fights foreign substances and infectious organisms in the body. Studies indicate that it is an effective spermicide as well and can prevent pregnancy. Against various human fungi like trichosporon, trichophyton, geotricum, microsporum, epidermophyton, candida and trichophyton, it is highly effective. It has properties to fight bacterial infection and microorganisms that cause m.tuberculosis, vibrio cholera etc. If neem oil is applied on lice inflicted hair, it kills the head lice. Studies indicate that it has shown promising results on different kinds of tumors and cancers. Neem oil can be mixed with carrier oil or vaseline and applied on affected areas like wounds, cuts and minor disorders of skin. To treat athlete’s foot, add a few drops in warm water and soak the feet in it. In areas where mosquitoes breed, just spray some emulsified neem oil. It is also used in preparing liquid for dishwashing, lamp oil and for getting rid of fleas and ticks in animals. Internal use of neem oil is not recommended. It has a toxic effect and could kill infants. It is best to discuss things with the medical practitioner in advance before taking any neem oil supplement. To dilute the oil it is best to maintain 2:5 percent ratio of any mixture. If any irritation exists then it is best to report this to a good doctor.